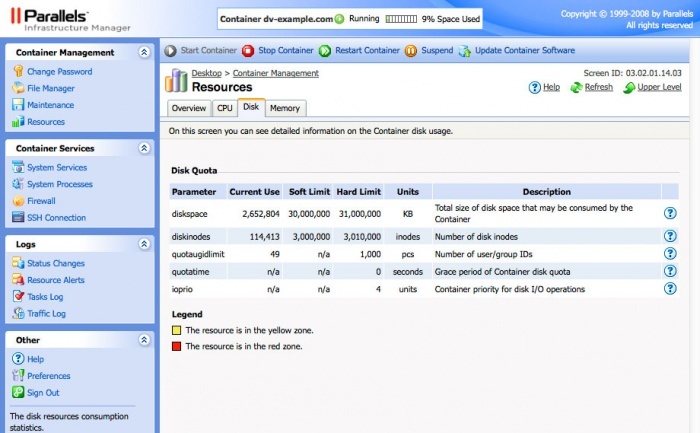 This article will show you various ways to monitor your server's disk space. 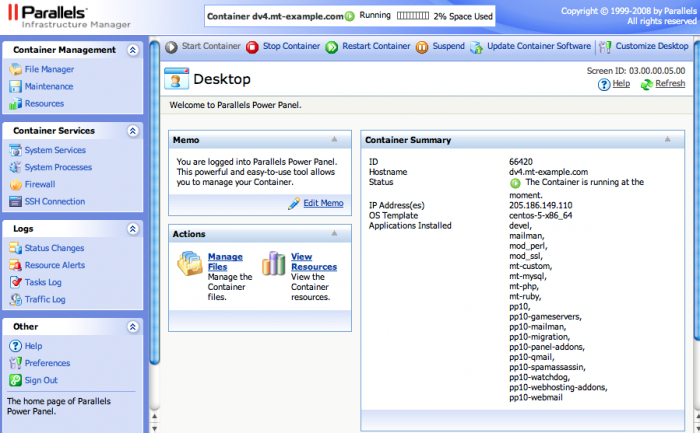 Each hosting platform has a specific allocated disk space. As your disk usage increases, you may notice a decrease in your server's performance. (mt) Media Temple offers disk management services via CloudTech, our premium services division. To learn more, please click here. You may view your Disk Usage Report at anytime in your Account Center. For detailed instructions and screenshots, please see: Viewing disk usage on your Grid hosting service. Log into your the Parallels Power Panel. For instructions on how to access, please see: Three Plesk panels. Total disk usage is listed by percentage at the top. You can also view a breakdown of the disk usage. From the left menu, click on Resources. Next, click on the Disk tab. Connect to your server via SSH. For detailed instructions, please read this article. du: This is the estimate file space usage. -s: Display only a total for each argument. -h: Print sizes in human readable format (e.g., 1K 234M 2G). The "Permission denied" notice is expected since the mail directory is owned by the individual email user, not the Server Administrator. The first column displayed is the device, in this case your DV. The next three columns show the total size, the amount used, and the amount available. You can use -m for megabytes. You can use -k for kilobytes. Another useful command is du. Running this command will list all directories with their filesize from your current directory. Again, the "Permission denied" notice is expected since the mail directory is owned by the individual email user, not the Server Administrator. Large log files are a common cause of unexpected issues on your DV. To prevent this, you can configure log rotation from within Plesk. Failed or overnumerous domain backups are a common cause of unexpected full disk space. Be sure to remove any files related to any failed Plesk backups. We also strongly advise configuring a tight backup rotation to clear out old backups when new ones are made. For information on how to remove large files, please see Common SSH Commands. Consider adding temporary disk space.